I'm back again, and when I did my post last month about the United States Life-Saving Service, I didn't know how many people would be interested in the topic. I mean, the USLSS (abbreviation) isn't something you hear about too often. But I had such an overwhelming response--and so much more information to share--that I wanted to do another post. 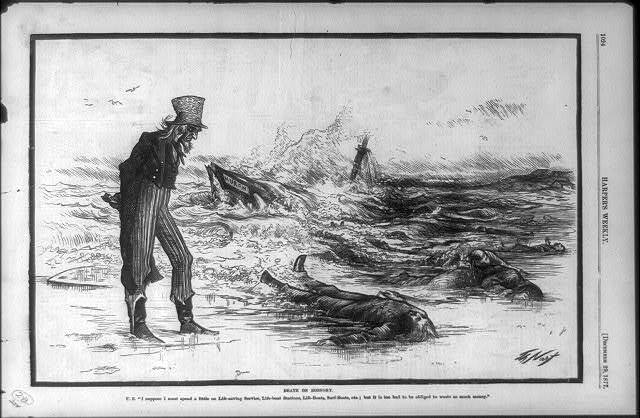 For a brief review before we delve back in, the United States Life-Saving Service ran from 1848 until 1915 for the purpose of rescuing sailors and passengers stranded on wrecked vessels. 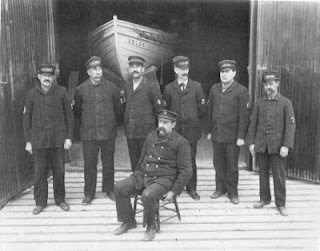 Modern technology and conveniences like radios and helicopters and speed boats that are used by the current Coast Guard were not available in the late nineteenth century, so the Life-Savers relied on special equipment, rigorous training, and manual labor to preform their duties. Visit last month's post for a more in depth introduction to the United States Life-Saving Service. When it was first created, the United States Life-Saving Service established stations on the Atlantic Ocean in places with a high incidence of ship wrecks, mainly from Massachusetts in the north to New Jersey in the south. But even though the USLSS was started in 1848, it was vastly ignored and underfunded until after the Civil War. Actually it was ignored until 1870, when strong Atlantic storms wrecked many vessels and hundreds of lives were lost. Newspapers then started calling for better equipped life-saving stations. Take a look at this illustration by the cartoonist Thomas Nast. is too bad to be obliged to waste so much money". So before long, a new head of the USLSS was appointed in Washington DC. His name was Sumner I Kimball, and he fought rigorously for more funding and is credited for the success that the Life-Saving Service saw until 1915, when it merged with the Coast Guard. 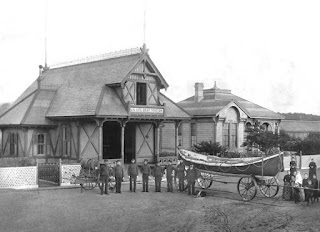 By the end of the 1870's, stations had been established not just in New England, but on the southern coast of the Atlantic, down into the Carolinas, Georgia, and even Florida. Stations were also established on the Great Lakes, which was at the zenith of it's shipping days. 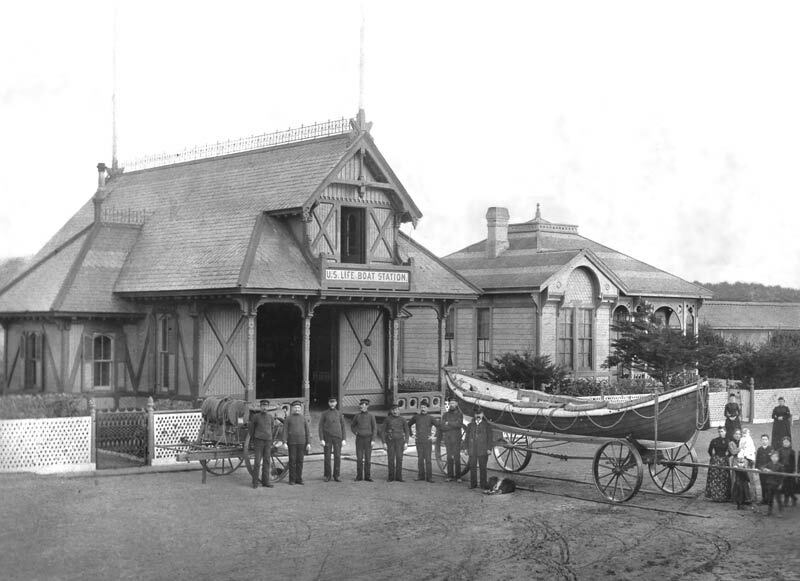 The number of life-savers employed by each station varied according to local needs, but most stations had 6 surfmen and a keeper. 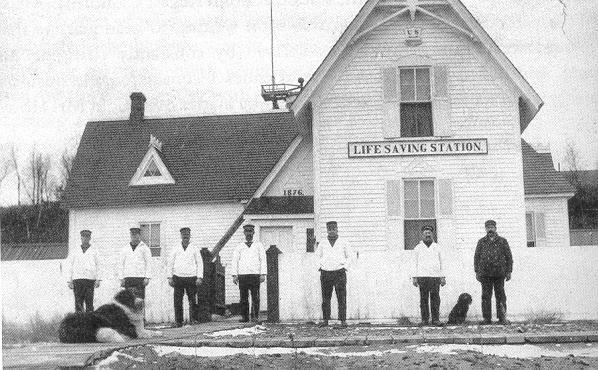 Here's some pictures of historic Life-Saving Stations and their crews. Thanks for joining me today! Next month I'll tell you more about the Life-Savers, specifically equipment the surfmen used on their rather dramatic rescues. A mother of two young boys, Naomi Rawlings spends her days picking up, cleaning, playing and, of course, writing. Her husband pastors a small church in Michigan’s rugged Upper Peninsula, where her family shares its ten wooded acres with black bears, wolves, coyotes, deer and bald eagles. 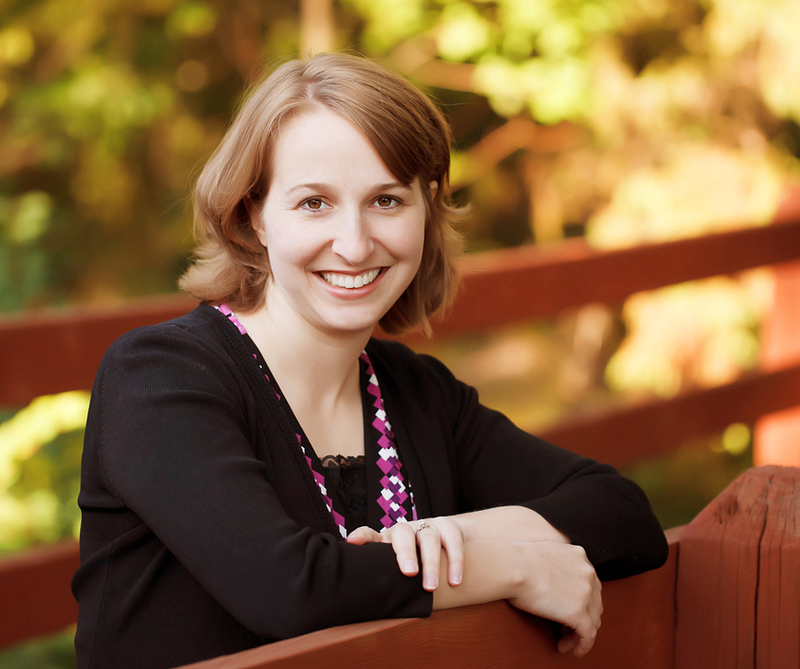 Naomi and her family live only three miles from Lake Superior, where the scenery is beautiful and they average 200 inches of snow per winter, and she is looking forward to the release of her next book, in January 2014. For more information about Naomi, please visit her website at www.NaomiRawlings.com. Wow! Can't wait for next month's post! This is all very fascinating, Naomi, thanks for sharing! Thanks for another interesting post, Naomi! Great research and fascinating history! Thanks, Naomi. Glad everyone is enjoying the posts. The Michigan one is my favorite too, but I'm a little biased since I live here. This particular station was located on Lake Superior, though it's no longer active. A single Coast Guard station in Marquette covers most of Michigan's Lake Superior shoreline these days. I'm biased, too! I live in the mid-Michigan area. My brother lives up in the U.P. and pastors there (I read your "About" page and saw that's where you are, too!). And my parents are in the northern tip of the lower peninsula. So, yeah, I'm biased about Michigan! It's my birthplace and home state. I'm a sucker for the Great Lakes shipwrecks. I have a bookshelf full of books on the subject. Thanks for such an interesting post! 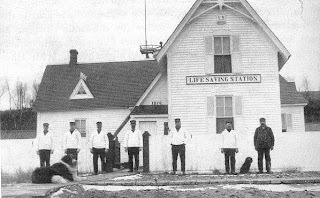 My great, great, great grandfather was the first Keeper at Beaver Harbor Life Saving station in Michigan. Fascinating stories revolve around these heroes. Can't wait for next month. Wow - how interesting...great job researching this...thanks for the post! I loved this post. We toured the station at Whitefish Point a few years ago - fascinating! I grew up in Kalamazoo, and the UP is absolutely one of my favorite places in the world. It's the Lake, the pines, the fresh air... Except for the Lake, it reminds me of the Black Hills! Yes, Whitefish Point has that station and the shipwreck museum with a lot of Edmond Fitzgerald artifacts. That might make a good future post. :-) And I've been to the Black Hills, very similar terrain to the western Upper Peninsula, except we have a really big lake to our north, and your hills are a little bigger. The other place I think is similar is the Adirondacks, but there again, those hills are bigger than ours. Hello Naomi, thanks for sharing ..interesting tidbits. Looking at the stations they remind me of the fire stations today. I like to see folks still interested in what happened in the past. What courageous men to brave the storm to rescue people from the sea. Thanks for sharing more of this amazing period of our history, Naomi. Thanks for stopping by, everybody. :-) I had a fun time sharing with you all yesterday!!! Thanks for sharing more information on the Lifesaving crew! We tend to take many things for-granted, not the least of which is that someone will be there to save us if we have a problem at sea. So grateful for these people and what they do.